Customizer Spotlite: Melancoly Kitties | Doll-Lite! I have always loved dolls — all toys, really. I had lots as a kid, and as an adult I found myself collecting action figures and dolls that caught my attention. I turned to the internet to find something once and a whole world of collectors opened up. I found artist customs and tutorials and online shops and eBay. That was in 2003, and soon I discovered Volks and their 12″ Dollfies. I adored the fact that there were so many options and they came ready to paint and that the company sold everything you’d need to make them your own. I purchased a few and immediately recognized that my hobby could become an artistic endeavor. Once I saw the Super Dollfies on the Volks site, I was enchanted. They were so exquisite. I pored over their pictures online and began to regularly haunt owner sites. At the time, I thought they were insanely expensive but soon I compromised with a Dollfie Dream and I dove right into painting and sewing for her. The rest is probably a familiar story to anyone in the hobby… I purchased another Dollfie Dream. Then I found LovelyHouse and brought home Shin Cho, then a Volks F-08 head… From there, the resin portion of my collection steadily grew. I painted and blushed my own dolls and worked on my sewing. 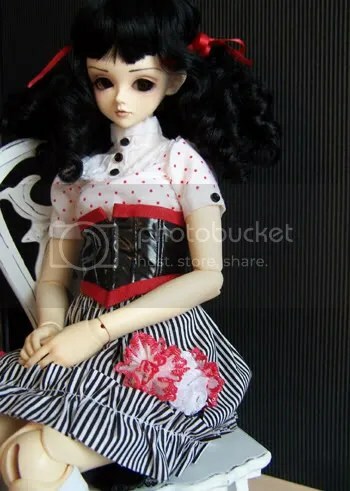 In 2004, I opened Melancholy Kitties to sell clothing for Blythes and Pullips, but soon I added clothing for BJDs. Early in 2005, after having worked on a few friends’ dolls, I offered esthetic services through the site. I really appreciate it when someone says they like my work even if its outside of their style or usual preference for their own dolls. I try to have my own style, but one that works for our customers, so hopefully when someone commissions me, they see their own vision when they look at their finished doll. What do you hope to accomplish in the next 5 years?We just had a baby last August, so I’m just now finding time to get back into the swing of things. We’ve also just recovered from a web crash, so now that the site is back where its supposed to be, I’m thrilled. I’ve begun to take in esthetics commissions and hope to do a bit of sewing soon. Clothing releases really wiped us out, so we’ll probably be functioning on a smaller scale for a while to come, but I think that will be a great opportunity. If I’m not aiming to produce larger quantities of items then I can return to doing one-offs and try new things. I’d love for the shop to have surprises for customers now and again. Mat and I are also really interested in perusing our sculpture and hope to make artist dolls to sell. I really want to take Melancholy Kitties to a doll show as a vendor, we talk about that every year. I think the business has really grown organically and allowed me the freedom to make a living and be home, so all I can really hope to ask for is more of the same. Being done! It sounds horrible, but really, I love wrapping the doll I’ve just painted to send it home. I also love photographing the final product, be it a commission or new clothing. Getting feedback is probably the most rewarding part of all, of course. I am a very very easy customer! The worst thing is that I am in a constant state of wanting to clean/reblush/ repaint all of them. The hardest part of the process can be communication, just because “smokey eyes and a red lip” can literally mean hundreds of different things. That’s when keeping the customer involved in the process becomes key. Also, trying to save parts of a face up and remove others is almost always more trouble than its worth. Honestly, any. I have done a lot of Unoas and I adore them, I think they have such amazing sculpts that they are simply easy to paint. I have painted far more female dolls than male, but that’s just the way its worked out, I really enjoy both. It is always exciting to work on dolls I’ve never painted before. I think its one of the best things about the job — I get to work on and photograph so many dolls that I never would have otherwise. I’d love time to collaborate with my husband again! 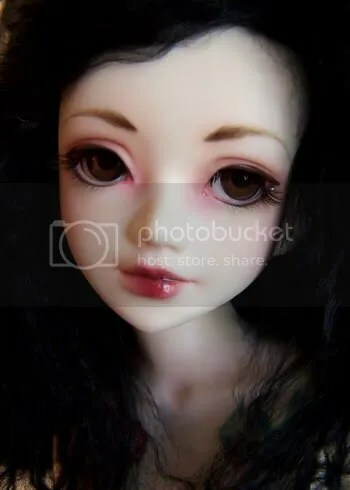 Why choose doll customizing as a form of Self Expression?I think its a nice marriage of being an art collector and an artist. 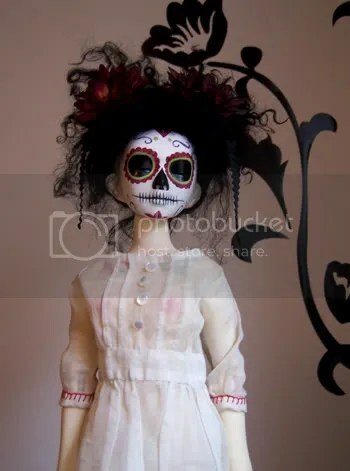 The dolls are amazing works of art in their own right and painting them and dressing them is really an amazing way to appreciate them when you think about it. It’s actually a collaboration every time. The actual painting only takes a few days, but what adds time is stopping to photograph, uploading and editing those pictures and sending them to the owner, waiting for a response, and then getting back to work. If its rainy or too cold, it can put off spray matting. So, time varies a lot, but I feel like I almost always get most of it done within 2 weeks of getting the doll and having all the information I need to start. I like to have a starting point, even if its something as simple as knowing the doll will wear light or dark colored wigs. It is wonderful to have total freedom, but I feel that the owner almost always has some idea about what they want, so its better to try and figure that out. I like to keep an open dialogue. I think its very important to not have much of an ego either, you need to really listen and sometimes put aside your own preferences to really create someone else’s vision. I really enjoy painting the Calaveras. Its an idea I had that I wasn’t sure it would be received well, but I’ve gotten a tremendous response from them. Sooooo many. There are a lot of things I’d like to do for my own dolls and photographs — sets and props and costumes I have been wanting to put together for years it seems. There’s a lot of clothing pieces I’d like to try for the store, more things for the big dolls and maybe a new category for tinies. 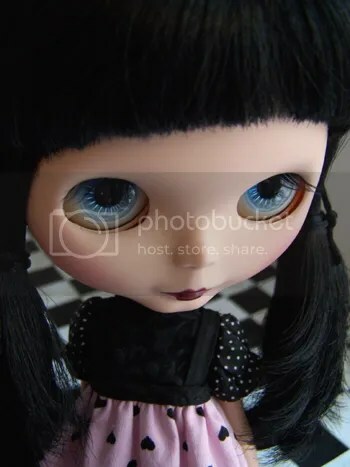 I really enjoy creating fullset Blythe dolls to sell, I’d love to do another. Its never ending, which is good. I like to think it has gotten better. I taught myself to sew, so that’s pretty straightforward — the more I’ve done, the more tricks I’ve figured out. I still remember the day I mastered sleeves! There is a lot I could still learn and I’d like to make more complex patterns. With face ups, I think I had to learn that more really is more and it takes a lot of detail work and unexpected bits of color to really make a face pop. I hope to keep getting better. I have an airbrush I want to play with, that’s a new frontier for me. I love it when someone either knows precisely what they want or they have just an idea that they are truly open to seeing interpreted. I like any information I’m given to help pin down a look or a feeling — I’ve had customers give me elaborate back stories for dolls and portraits of the characters they were to embody. If the customer isn’t so set on a direction, then it helps if they sincerely trust me. Though honestly, as long as they hired me because there was something about my work that spoke to them, I’m happy. 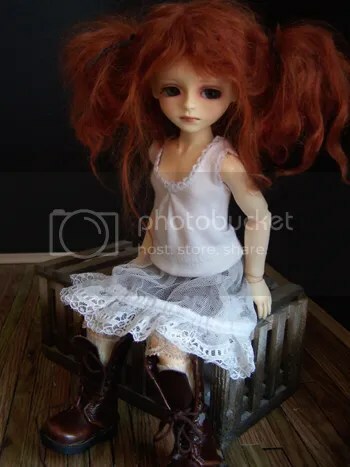 Do you paint other types of dolls, and if so, how does that compare with painting BJDs? 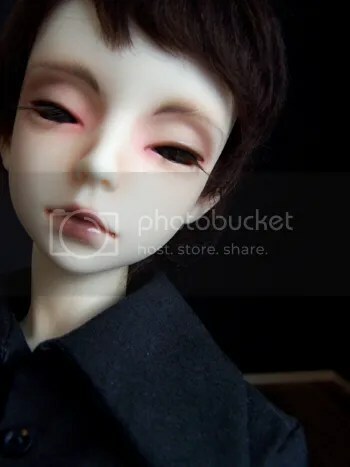 If you do other types of art (drawing, painting, etc) does that influence your faceup style?I do, I paint Blythe and Pullip dolls.&nbsp; Painting them is similar, but dealing with plastic is different than resin. There are different ways to customize their eyes and eye mechanisms and you can re-root them. I do draw and paint but haven’t done much in a while — I actually found everything I needed when I started customizing dolls just by digging through my own brushes and paints and pastels. I think understanding even basic painting concepts like how to mix colors or where shadows fall and light reflects can help tremendously with face ups. I don’t know that I had a style before I started on dolls, but different dolls do influence each other for me. 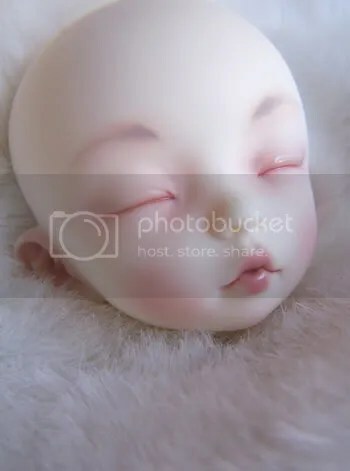 After repainting a few Blythes I gave the same simple bee-stung lips to my Ciel, and I’ve painted some Pullips the way I would a BJD. Its fun to try something that might be outside of the “norm” for that type of doll. I have not. I think the only thing that I would refuse would be to exactly copy another artist’s work. 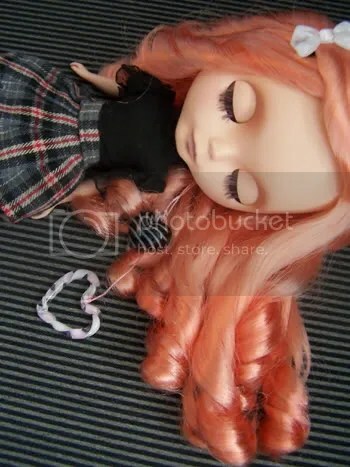 Its not uncommon for a customer to send me pictures of dolls I have not painted, but usually just to convey a “feel”. I would never recreate a face up exactly. I have stopped taking clothing commissions entirely because I find it to just not be cost or time effective for me to try and sew something someone else has designed. I find brows to be incredibly influential to the whole expression of a face. Just by altering their angle a bit you can made a doll seem worried or angry. It is really important for me to work with the structure of the face, so I tend to think that dolls come with expressions already — it is just my job to highlight them. Again, I think brows can be very influential. Thinner, shapelier brows tend to read as more feminine, as do thicker lashes and redder lips. Of course, there’s lots of exceptions to all three and I think it almost always comes down to the wig and clothes on a doll. Especially in this fandom, many heads and face ups are equally suited to be male or female. Can you offer any helpful hints to the amateur faceup artists? Can you recommend a list of supplies including colors, paints & pastels etc? Practice A LOT. Spend a lot of time scrutinizing face ups you’re drawn to and figure out precisely what the artist has done that you like. Work in stages, figure out what is the most difficult for you and work on that first, so that if you need to start over, you’re not wiping everything. Be prepared to invest in high quality materials, especially brushes and Mr. Super Clear. Most importantly, BUY A RESPIRATOR. Nothing is worth compromising your health and MSC is serious stuff. Always spray outside and always wear a respirator. I’ve begun small sculpting projects and I really enjoy it. I don’t know if I’d ever feel ambitious enough to attempt a full ball jointed doll, but I really like making small odd dolls. Always. I made sock dresses and cardboard houses for my Barbies. Describe each of your dolls in one word. Do you have a favorite doll? What makes it special?Mina, my Volks old F-08 is my favorite. I think that head is just delicate and really pretty and funny because of its asymmetrical eyes and huuuuge forehead. I like it when a head is imperfect that way and you sort of feel the connection to the original sculpt. She came together easily too, she was a head I purchased through a shopping service, then I found her a SD13 body on eBay and I fell madly in love. It still my favorite body by far, She poses naturally and there are so many tiny details in the sculpt that make it seem softer and a bit more lifelike than so many others. The little rolls of skin at the armpits still thrill me. I don’t ever change her eyes and she has 5 or 6 wigs that look almost the same — somehow she’s just right as she is. I collect Blythes and Pullips and a few random dolls, some vintage, some modern. I love kewpies and things from Alice in Wonderland. I have a dollhouse and I love miniatures, especially Re-ment. Both my husband and I have some artist vinyl figures and lots of random toys. Beyond that, we collect old scientific equipment and Halloween decorations. We’re collectors, for better or worse. Thanks Kat (and Mat) for the interview!